We were beginning to think it would never happen, but LG finally sent us one of its OLED TVs to review: We asked for a 55-inch model and the company sent us the 55E8PUA. As much as we’ve talked about LG’s OLED TVs, we’ve never had one in the test center (we reviewed a Sony OLED last year). Enough history. It came, we saw, it blew us away. The 55E8PUA is a 55-inch-class TV with 3840x2160 resolution. It’s based on an RGBW OLED panel, which means every pixel consists of a red, green, blue, and white subpixel. It also supports a variety of HDR formats: the common HDR10 and Dolby Vision, as well as Technicolor’s Advanced HDR and HLG (Hybrid Log-Gamma), an HDR standard in play in other parts of the world (and in some Sony camcorders). This TV weighs in at 48 pounds and its stand adds another three pounds. The design of the stand is worthy of mention: Instead of attaching with a bunch of screws, it uses captive bolts to pop right on to the clear extension at the bottom of the TV. It’s very clever, as are a lot of things about this TV. There’s a 300mm x 200mm VESA mount if you’d prefer to hang it on the wall. One of the E8PUA's four HDMI ports are on its back. Three more--including one with ARC--are side facing. 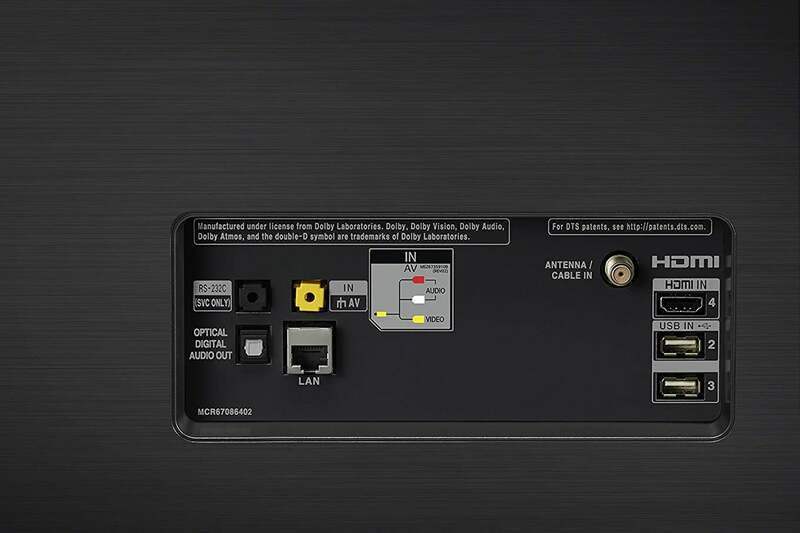 Ports include four HDMI (three side-facing, one with ARC), three USB (one side-facing) one ethernet, one coax for cable or an antenna, and RS-232C port for custom remote control, optical audio out, and a 3.5mm, two-ring, composite video/stereo analog audio output. The TV will automatically step up the HDMI inputs to 10-bit color when required. LG talks about an AI (Artificial Intelligence) processor. Put politely, most of what is being discussed and sold these days as AI, isn’t. It’s simply clever programming, a settings database, and some machine learning. The E8PUA’s image processing is top notch (only Sony’s is better). Why not just say that? For cable users (or cord-cutters tuning in over-the-air broadcasts), LG provides a very nice program guide. It’s the equal of Sony’s, which is one of that company’s better features. LG’s magic remote and the WebOS user interface are the best in the industry. The first time I used the remote it was bit of a what-the-heck moment, but in short order, the ability to move anywhere on the screen with the cursor started to feel natural. It also had me wondering why all remotes don’t function this way. Though it looks normal enough, the Magic Remote controls a free-moving cursor, so you can jump about the interface as with a mouse. It makes for a huge uptick in ease of use. Huge. The WebOS user interface is very well done. It’s logically and intuitively laid out. The joy comes with the ability to move about non-linearly. I could go on, but the Magic Remote and WebOS simply put everything else to shame. After reviewing so many LED-backlit LCD TVs in a row, I’d almost forgotten what real black it looks like. I missed it. The E8PUA has it in full measure, as just about every OLED TV does, and because of it you get the benefit of HDR with less brightness. But it’s not only the blacks that set OLEDs apart, it’s the lack of backlighting artifacts, such as halos (other than the ones your eyes create on their own), blossoming, and blocking. Not having to watch zones light up, dim, and lag is worth the extra cost. Assuming OLED is even remotely within your budget. The E8PUA’s color acuity is very, very good. It’s not quite at the level of quantum dot, especially in bright areas, but overall there’s really little to complain about. 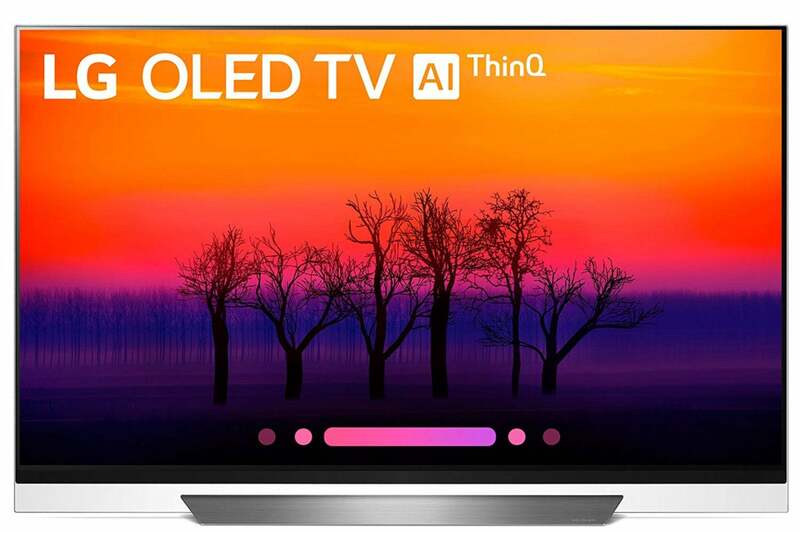 Screen uniformity (lack of cloudiness or dark areas) is basically perfect, and way beyond what you’ll get with even the best LED-backlit LCD TVs. That said, I’ve rarely had any complaints with Samsung’s QLEDs or even the mid-range sets from Sony and Vizio in that regard. This is probably the worst screen we've ever seen on a TV ad. It simply doesn't do the TV justice in any way, shape, or form. Motion handling was also very good, even without the TruMotion set to smooth. I set it to smooth because jerky pans drive me crazy. The Hollywood purists who want this feature removed from TVs, can kiss my grits. I have no issue with the minute drop in detail. I did encounter slight moiré in high-detailed areas, and in some cases when they were panned. I’m being picky here because the E8PUA’s overall picture quality is better than just about any other TV I’ve seen. Still, it was sort of like taking down nine instead of 10 bowling pins with your last ball when you were flirting with a perfect game. The MPEG noise-removal setting had no effect, which might be because I was using h.265 files. The E8PUA’s audio performance is exceptional, though not quite as nice as Sony’s Bravia A1E OLED with its planar driver. The LG produces just a little less bass. You can use the Dolby Atmos feature to “up-scale” other audio as well, which imbues plain material, just a bit more spatial presence. This TV gets very loud, too. There are tree side-facing HDMI ports and one USB port. 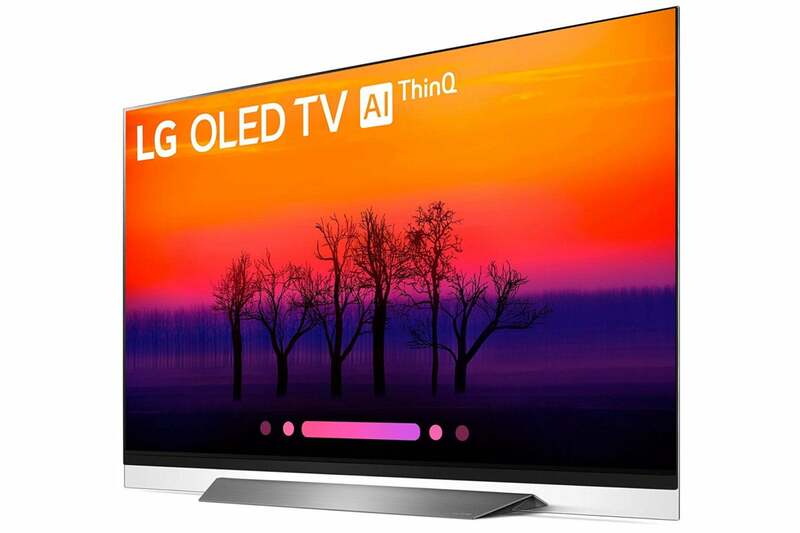 The one issue with OLED TVs, beyond the price tag, is that they have a rather limited lifespan and are subject to burn-in if you leave a static image in place for too long. For mild use, say two hours a day watching TV or movies, you won’t have any issue. But you definitely don’t want to use one as a display sign. The E8PUA will typically generate between 150 and 250 nits in bright areas with standard dynamic range (SDR) material. With SDR material in mind, LG rates the E8PUA for 100,000 hours to half brightness. That means it will produce 75 to 125 nits after displaying 100,000 hours of SDR video. You’ll notice a difference, but I don’t know how much it will bother you. I measured the E8PUA producing as much as 700 nits while displaying HDR material, so the OLEDs will decay much more quickly in that mode. Keep in mind that light viewing, say two hours a day, is 730 hours a year—7,300 hours over 10 years—so practically speaking, you shouldn’t notice much of a difference. You can read more about OLED aging in this article. Of all the TVs in all the test centers in all the world, LG had to ship the E8PUA to mine. Sony’s sound on its OLED’s (which use LG panels) is slightly better than LG’s, but it’s darn close, and LG’s Magic Remote and WebOS blow Sony’s equivalents out of the water. With the pictures just about dead even, a joyous interface experience puts me firmly in the E8PUA’s camp. Put more succinctly, it’s the best TV I’ve tested.